New Delhi, 26th March 2018 - This season Duracell, the iconic consumer battery company and the leading manufacturer of high performance alkaline batteries worldwide, gave Delhiites the perfect opportunity to realize their true potential and enjoy a fun-filled day with their loved ones. The brand successfully concluded its family-run titled ‘Durathon’ on 25th March in the Connaught Place area of New Delhi, which saw participation from around 1000 people, who are running enthusiasts. The ‘family-run’ was based on the concept of ‘running stronger for longer,’ which is symbolized by Duracell’s ever-running Bunny mascot. This one-of-its-kind event allowed families to run together, driven by the spirit of family bonding and the concept of longevity and unstoppable power. The Delhi run saw an overwhelming participation from the city’s residents due to its family-theme. The run highlighted how a lifestyle of greater strength and power can be achieved by family members coming together, unlocking their true power and improving their performance, concepts that are central to brand Duracell’s batteries. Kick starting early morning, the participants were energetic and enthusiastic for the run. 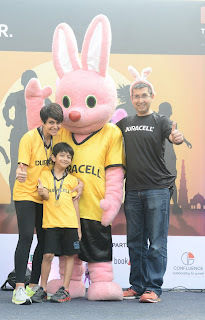 Duracell celebrated this run with around 1000 participants. For the pre-buzz, Duracell did a lot of school activations, to create awareness amongst parents and their children about the run and encouraged them to register and participate. This included fun activities at schools that created much anticipation in them. The Durathon also saw participation from the doctors of Fortis, Shalimar Bagh Hospital along with their families.